We have heard in the past that this high dose thyroid supplementation will be adverse to the long-term health of your dog. With all of the years we have been using thyroid supp with has been ever increasing over the years, we have not seen tht to be the case. It is the belief of this writer that quality of life issues will supercede almost anything unless there is some immediate detrimental affect from this supplementation and we know that not to be true. For many years, National Greyhound Adoption Program and its Director, David Wolf, have firmly believed that greyhounds with low esteem benefit from high doses of thyroid supplementation. There are, of course, exceptions to the rule where you don't actually need high doses and may be effective with lower doses. In all of the years that NGAP has been suggesting thyroid supplementation, we are not aware of dogs dying prematurely or of developing debilitating medical issues from the use of this supplement. 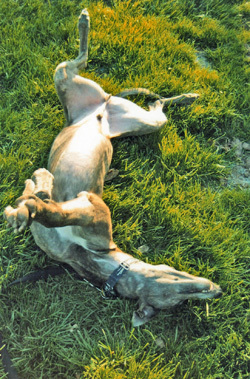 For some greyhounds, the supplement has been life-changing. Dogs that were afraid to walk across slick floors, or lay outside on their backs, relaxed, belly up, enjoying the day, that would not interact with their owners or other pets, will now do those things! This small pill, Soloxine, somehow changes their life - and isn't that exactly what we want to do? We recently spoke to Deidre Justice about her dog, Pharaoh. Pharaoh was in to see us June 23, 2009. He had severe anxiety issues. His T4 test was initially 0.9 on a normal range of 1.0-4.0, which would qualify him as being hypothyroid, but for a greyhound, 0.9 is quite normal and is a number we see quite often with dogs that have no anxiety issues whatsoever. Pharaoh, who weighs 83 lbs, was initially given a dose of Soloxine 0.8mg, twice daily. Significant improvement was shown. After this improvement, the owner tried to take the dog off of the Soloxine and he regressed. Pharaoh is now currently under the care of a local veterinarian in New Jersey. He is on a dose of two (2) Soloxine 0.8mg, twice daily and apparently is as happy as a clam! We are awaiting T4 test results from her veterinarian but she said if they drew the blood in less than 5 hours after the pill was given, the read number would be too low and subnormal. They like to draw the blood between 5 1/2 to 6 hours after pills are administered. We will publish the results along with this information shortly. Pharaoh is getting a dose similar to a dog named Spooky that we did a clinical trial on. Spooky's initial T4 was measured at 0.4. He, ultimately, was also given two (2) Soloxine 0.8mg twice and day, and yes, Spooky also became as happy as a clam. During that trial, we tried to wean him off the medication totally only to find that he also regressed. In the final analysis, he was given one (1) Soloxine 0.8mg twice a day at the time of adoption. Medicating Pharaoh on this high dose has not caused him to be hyperthyroid, according to test results. We now have a dog that is happy with his life and he has been happy since 2009. Pharaoh will be turning ten next year.